Hey guys, and welcome to Weekly News Wrap. Today we're going to be discussing and breaking down the big news stories of the week. We're going to be publishing these so that we can cover more obscure news that we wouldn't normally cover. JENA MALONE COULD PLAY BARBARA GORDON IN "BATMAN V. SUPERMAN"
Latino Review released a scoop earlier this week that Jena Malone, who was cast in the upcoming Batman v. Superman: Dawn of Justice as a mysterious role, will play Barbara Gordon. In the comics, Barbara is Jim Gordon's daughter, and eventually turns into Batgirl, and eventually Oracle. She is also famously shot in the Joker origin story The Killing Joke. While many people believed that Malone would play Carrie Kelly in the film, it seems likely that she will play Gordon. However, there is no confirmation if she will turn into Batgirl in the film. As for my opinion, Jena Malone is a fantastic actress and I'm sure she would be great as Barbara Gordon. However, Batman v. Superman is seeming SO crowded at the moment. Between Batman, Superman, Wonder Woman, Lex Luthor, Aquaman and Cyborg, there is basically no room for anybody else. Why not just introduce Barbara Gordon aka Batgirl in the solo Batman movie that Ben Affleck is going to make? If this report is true, hopefully Barbara Gordon will not turn into Batgirl, and just be a side character just to give an introduction to Barbara Gordon and Batgirl. At SDCC, 20th Century Fox showed a trailer for Deadpool that got fans super excited for the upcoming film. This week, the trailer was released online. The Red Band version is the one enclosed in this article, and the Green Band trailer is on our Trailers page. Personally, I liked the Red Band version a LOT more than the Green Band. It's more fun and seems much less held back than the Green Band trailer. However, the trailer was super cool and got me excited for the film. COLIN FARRELL CAST IN "FANTASTIC BEASTS & WHERE TO FIND THEM"
Fantastic Beasts and Where to Find Them, the Harry Potter spinoff film, already has an impressive cast, with Academy Award winner Eddie Redmayne starring in the movie. Recently, Colin Farrell has been added to the cast of the film. To start, this movie is getting quality actors to star in the movie. Colin Farrell is not a great lead, but he is fantastic in supporting roles, as shown in films such as Minority Report. If he can be a cool wizard or something that would rock! I'm SO excited to revisit the Harry Potter universe, and that JK Rowling is penning the script. Warner Brothers has always done Harry Potter films so well, with such respect for the source material, and while I was initially skeptical of the film, I am now convinced and pumped to see this spin-off. In a recent announcement where Sony Pictures revealed their upcoming movie slate, the company confirmed skepticism in Hollywood that Bad Boys 3 has indeed started production. It is implied that Martin Lawrence and Will Smith will return, and most likely Michael Bay will not return to direct. I've personally never seen the Bad Boys films, however good buddy cop movies are some of the most fun you can have. However, if this film is just being made for money, I will be heavily disappointed. Fun comedic action films have recently been brought back from the dead with 21 Jump Street being such a huge success. This movie could be super fun, and so I'm excited for the film. A few days ago, the first full trailer for the next James Bond film, Spectre, which debuts November 6th. The film stars Daniel Craig (Casino Royale, Skyfall) as he returns as the iconic James Bond, who works to discover an evil organization. While M (Ralph Fiennes) attempts to keep MI6 alive, Bond uncovers SPECTRE, and its evil leader Franz Oberhauser (Christoph Waltz). To start, this trailer has gotten mixed reactions. To start, I am SO excited for Spectre, despite not liking Skyfall. This film seems to have an even grittier edge than Casino Royale and Skyfall, which seems cool, and seems to be more of a detective thriller than the other Daniel Craig Bond films, which were loaded with action. However, the trailer did not show much fighting, which makes me worried that the film could get slow and slightly dull. Christoph Waltz (Inglourious Basterds, Django Unchained) seems like he's killing it as the villain, however, and a possible twist where Waltz turns into the evil Ernest Stavro Blofeld could be amazing! I love the early Bond films where SPECTRE is dealt with (Dr. No, From Russia with Love, You Only Live Twice, On Her Majesty's Secret Service, Diamonds Are Forever), and so I think it is super cool that Sam Mendes and the Bond franchise is going back to its roots. However, could Bond be a really great detective movie? We've never really seen it before, but this is what it seems the direction the new Bond film is going in. Are you excited about this new direction? Comment below and make sure to voice your opinion on the trailer! So, The Revenant is directed by Alejandro Inarritu (Birdman) and stars Leonardo DiCaprio (The Wolf of Wall Street, Titanic) and Tom Hardy (The Dark Knight Rises, Mad Max: Fury Road). The film is based on the true story of Hugh Glass, an 1820s frontiersman who starts out for vengeance against some people who left him for dead. Now, even though this is a teaser, I was personally not impressed with this trailer. I'm sure the film will be good, and will most likely contend for Oscars, but this teaser seemed loosely cut and did not give much sense of story. The images felt extremely repetitive, even though it seems as though both DiCaprio and Hardy will give good performances. I was personally not impressed with the trailer, but I am hoping that the film will be fantastic! 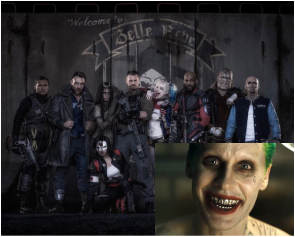 SUICIDE SQUAD TRAILER RELEASED IN HD!!!!! Hey guys! 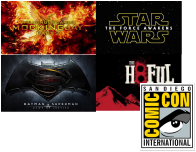 So, as we are mostly all aware, SDCC (San Diego Comic-Con) has just wrapped up and DC gave us some exciting information about their upcoming films. One of these movies they discussed was Suicide Squad, which is a film based on a famed comic about a rag-tag group of villains forced to work together by the government to secure their freedom. Anyway, we got our first look at the film's trailer (down below)! We also got our first look at Jared Leto as The Joker! As for me, I absolutely LOVED this trailer! The whole premise looks awesome, the characters look like they have depth and charisma, and Jared Leto looks fantastic as The Joker. I was originally opposed to Leto playing The Joker, especially so soon after the tragic loss and amazing performance of Heath Ledger in the role, but Leto's killing it. His voice and facial expressions are exactly what I wanted from the Joker, and cannot wait to see Suicide Squad, which debuts August 5, 2016, is directed by David Ayer (Fury, End of Watch, Training Day) and stars Will Smith, Margot Robbie, Jared Leto, Jai Courtney and Viola Davis!